SCI's cellular container services have now matured from their infancy stage to adult stage. 'M.V. LAL Bahadur Shastri' along with M. V. Rajiv Gandhi & M.V. Indira Gandhi have completed 16 years in service. SCI’s cellular container services have now matured from their infancy stage to adult stage. 'M.V. LAL Bahadur Shastri' along with M. V. Rajiv Gandhi & M.V. Indira Gandhi have completed 16 years in service. With the induction of two 4400 TEU vessels namely M.V. SCI CHENNAI and M.V. SCI MUMBAI, our container vessel strength now stands increased to five vessels. 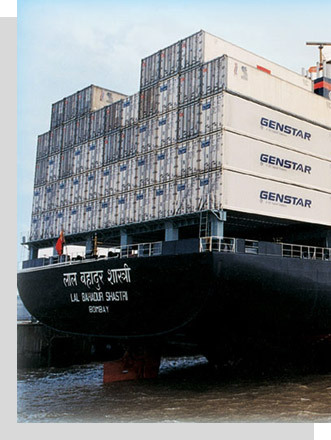 In addition, we have in-chartered state of art cellular container ships to augment our fleet strength. Operating container ships flying different flags and manned by crews of different nationality has broadened SCI’s outlook and has benchmarked its activities with the best in the industry by successfully bridging the gap between the global operators and SCI on proactively innovating, adapting, modernising its organizational culture and work practices. The focus of SCI and especially CONOPS department has always been to be alive to the new challenges in the industry and adopt the best industry practices and provide its business partners and clientele safe, reliable and economic shipping services, which is an integral part of our vision objective. During the last year, we have made conscious efforts to become even more eco-friendly by prudent fuel management and operational scheduling of ships and promoting coastal movement of containers along the Indian coast and we have successfully expanded our coastal business & today we are one of the major coastal operators. Our operating philosophy makes it imperative that we streamline and standardize our procedures and information flow to enable optimum asset utilization, speedier and more consistent decision making, and achieve synergy between Operations, Commercial and Equipment Control segments of the department.